SMA and Siemens just announced their cooperation in the field of megawatt PV projects. At Intersolar Europe in Munich, we present the first joint technological development, the SMA MV Power Station 2500 SC. Let’s take a look at this completely new turnkey solution with Boris Wolff, Executive Vice President of the SMA Business Unit Utility. Learn more about the new cooperation between Siemens and SMA on our webspecial. Find technical details about the new SMA MV Power Station 2500 SC on our website. 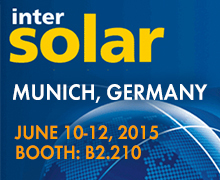 Or visit it us on our booth at Intersolar Europe. I'm a Press Manager at SMA. Just about everything that has to do with SMA. As a teenager I competed in luge at the "Youth Trains for the Olympics". I am very disappointed with your service techline support in ca. us and Germany. We have been trying to do a start up on a sma-5000-12 us inverter for about 6weeks in the turbine mode. The us tech serviceline has been of little help as they say they have no experience with turbine mode, so they refered us to Germany. We have e-mailed them also with no response so to say we are disappointed is a under statement. If you have anyone that can help please e-mail me at above e-mail or call at 602-388-2516 ask for Brian N.
we are very sorry about this. Our service colleagues will contact you directly soon.